A stunning b&w image, so lovely and full of beautiful tones! Strong geometric features… good shot! Too bad the bird had to die. All the elements for expression are present is this image, Krasimir — dynamic diagonal flow, the strong symbolic focal point of the minaret, and the symbolic form of life in the flying bird. 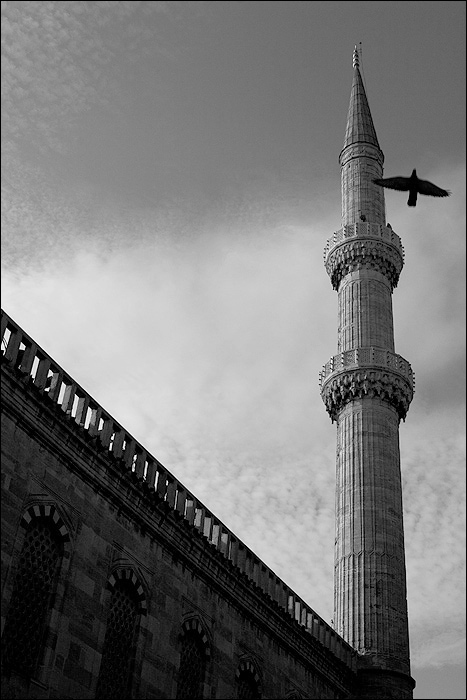 However the bird’s wing overlaps the minaret and makes it appear to be attached or caught. It is difficult to place a flying bird perfectly in the frame, but you can increase your chances by shooting such subjects in bursts, thereby placing a bird such as this in varying distances from the minaret. Hey guys, my name is Irving Jones! People ask me “Sir, Irving Jones, I need your professional help” and I always accept the request, `cause I know, that only I can save their time!